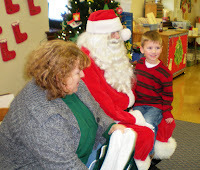 We had a visit from the big man himself this Thursday. That's right, Santa came to visit us. 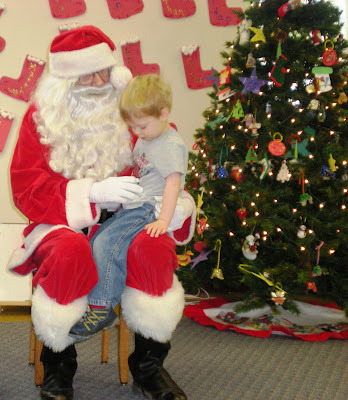 We are lucky that our community's town watch has a Santa that visits local nursery schools and daycare centers. We don't tell the children that he is coming so it is a big surprise (I do let the parents know in case anyone might still be frightened of him). During playtime all of a sudden bells will start ringing and I have 12 little children standing there is awe. It's always a big hit. 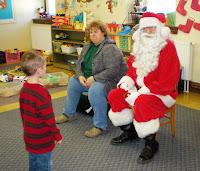 Out of my 23 children this year only two didn't want to have a special visit with Santa. I would say that is a success. Ironically, my son came home from school this week with a St. Nicholas Day poem. It's a bit long, but I thought I would share it in case anyone was looking for some information on St. Nicholas. We remember this, such a holy, good man. Many miracle Nicholas hastened to do. Many are pictures with fisherman's net. With in hand, soon they were wed. Kid's in Germany, Netherlands, too. Asks that present be given to children like you. Giving gifts was his custom--we still do today. Follow Nicholas today--do a good deed. How fun for your preschoolers! Santa looks terrific! Thanks for posting the poem about St. Nick. My girls will love that. I bet it was great seeing the kids so surprised to see Santa. The girls sat on Santa's lap twice this year and my 7 year old keeps asking me- can we please see the real Santa soon. She's not going for the fake beard anymore. Luckily, the real Santa is at our local mall with a real beard and calls the girls by name. They have been going since their first Christmas!